The best attribute of Belt Speed Change Drives is that they may be manipulated while the machine is running. 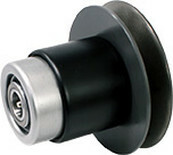 The operator may adjust output speed by turning the dial to mechanically change the pitch diameter of the pulley. This space saving design is easy to install, and is virtually maintenance free. Changing belts is really the only preventative maintenance concern during the device lifetime. Contact Miki Pulley for more information or request a quote today. 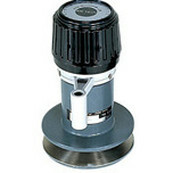 The P model is a variable diameter pulley with a standard V-belt that changes rotational speed on the motor side. The unique cam mechanism prevents slips, and speed can be changed without altering the center distance relative to the driven side. 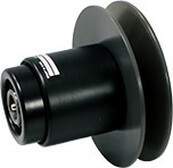 The AP model is a variable diameter pulley with a standard V-belt that changes rotational speed on the motor side. The unique cam mechanism prevents slips, and speed can be changed without altering the center distance relative to the driven side. The PL model is a variable diameter pulley with a standard V-belt that changes rotational speed on the motor side. This mechanism can accommodate a large speed change ratio, up to and including 1:24. 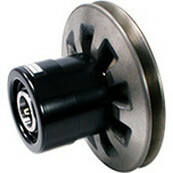 Applicable motor range for the 4 available sizes include 0.2kW to 1.5kW (4-pole). 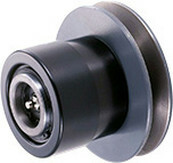 The PK model is a variable diameter pulley with a standard V-belt that changes rotational speed on the motor side. This mechanism can accommodate a large speed change ratio, and Applicable motor range for the available sizes include 0.4kW to 18.5kW (6-pole), with 6 sizes offered in the lineup. The PL model is a variable diameter pulley with a standard V-belt that changes rotational speed on the motor side. 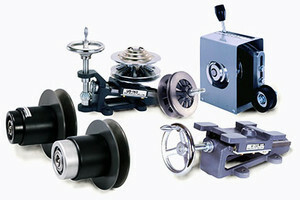 Due to the double swinging design of the pulley, the belt profile remains constant assuring long operational lifetime. Applicable motor range for the 4 available size: 0.4kW to 3.7kW (4-pole).